Photo by MANUEL ORBEGOZO bemoaning low election-to-election turnout is missing the point. Elections ignite two passions in Americans: the desire to predict the winners and the need to fret about low voter turnout. The two are connected. The easiest prediction to make about United States elections is that turnout will be low. U.S. voter turnout consistently ranks among the lowest in the developed world. The United States Election Project estimates that only 36.4 percent of the voting-eligible population (VEP) cast a ballot this November. This makes the 2014 electoral turnout low even by American standards. Not since 1942 have fewer cast ballots in a midterm election. However, we should put this low turnout discussion into context. Over the past century, the difference between midterm elections considered to have high turnout and those considered low is minute — we celebrate a midterm election with 42 percent turnout and bemoan one with 38 percent. But such differences are trivial in a comparative perspective; Australia surpassed 95 percent turnout in recent elections and France topped 84 percent. We could add a litany of other countries to this list. If the United States saw 80 percent turnout, would we be so concerned if it dropped to 76 percent for one election cycle? The minuscule difference between high- and low-turnout elections indicates we should shift our focus to asking why U.S. elections generally have low turnout, rather than lamenting that 2014 was slightly lower than normal. The general argument for why U.S. voter turnout is low compared to the rest of the world focuses on Americans' apathy. Here are some reasons to be skeptical of such arguments: In the United States we vote for more offices than any other country and almost no other country has primary elections. In the U.S., we go to the polls twice to decide a single election. Also, there are more than 520,000 elected offices at the local, state and national level in the United States, which equates to about one elected official for every 590 Americans. In other countries people vote less often, for fewer offices. Consequently, in other countries every vote cast has a large impact. 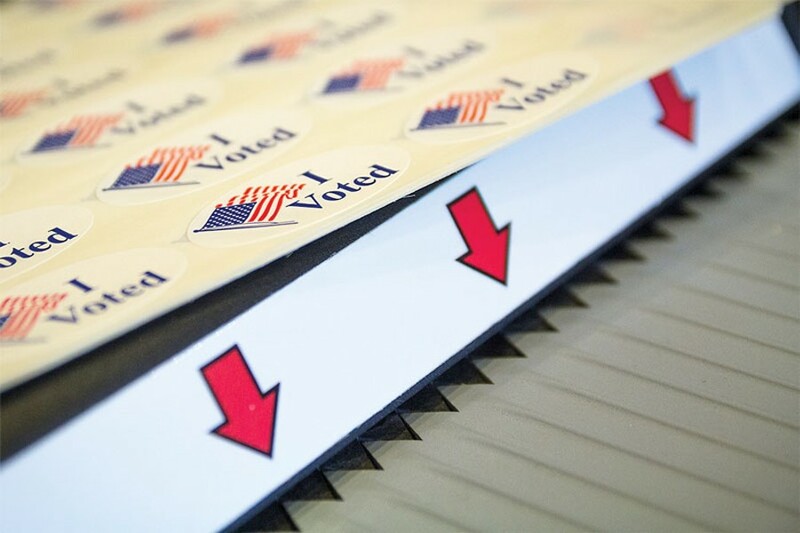 The concept that frequent elections lead to low turnout is referred to as "voter fatigue." If you average the voters that turn out over three or four election cycles, U.S. turnout doesn't look quite as bad. Probably more important than voter fatigue is the United States' emphasis on personal registration requirements that necessitate registering some days or weeks in advance of the election. In most countries registration is automatic. Canada, for example, has 93 percent of its population registered because it uses automatic registration; in the United States only 68 percent of eligible voters are registered. High registration rates lead directly to high turnout rates. No state automatically registers people, but 10 states do offer same-day-registration, which allows people to vote on the spot. For 2014, seven of the nine states with the highest voter turnout had same-day-registration and, in the 2012 presidential election, states with same-day-registration had 71 percent turnout compared to 59 percent in states without. Finally, turnout for elections is driven by the competiveness of an election. When an election is close, people feel their vote matters and campaigns invest in getting people to the polls. There were very few competitive elections this fall compared to other years. The Cook Political Report rated just 38 of 450 House races as competitive. This means that in 412 congressional districts there were few advertisements and few campaign staffers making sure people were registered and "dragged" to the polls. Although this midterm election set a record with $4 billion in campaign spending, those dollars weren't distributed throughout the country. The New York Times reported "that just 25 contests account for 80 percent of all reported outside spending" for this election. In a few places there were serious get-out-the-vote efforts with lots of campaign spending. Consequently, those places saw high voter turnouts. In places where little campaigning occurred, people seemed to forget there was an election. Close elections also seemed to spur high turnouts. For example, Colorado and Alaska had 53 percent and 55.3 percent turnout, respectively. The campaigns in these states spent money and got people to the polls. California had no U.S. senators on the ballot, and the gubernatorial race could have been predicted two years ago. In this noncompetitive election, California saw only 31.8 percent of its registered voters cast ballots. Given that California is by far the most populated state, its dismal turnout single-handedly drove down the national average. If California's percentages are removed from the calculation of the national total, the country's turnout rate increases to 37 percent, which isn't much lower than many of the midterm elections over the last 30 years. Given that Humboldt County is in a noncompetitive state without same day registration, where voters are recovering from a June primary, the county's 37 percent turnout isn't that bad. There are also enough ballots that remain to be counted that the turnout could even go above 40 percent. There are a number of people who argue elections don't matter anyway; if they are correct, then low voter turnout is irrelevant. And it is true that a Humboldt County voter had little reason to show up to cast a ballot for governor, Congress, State Assembly or State Senate. The outcomes were a given. Although I find it strange that in the election where a person's vote counts the least — the election for electors to select the president — voter turnout is always the highest. In elections where people's lone vote matters the most — local elections for school boards, special districts or city councils — turnout often drops below 20 percent. In many local elections there are only a couple thousand voters and, sometimes, only a few hundred. An individual's vote in small elections like these can actually influence outcomes. Still, people consistently vote in elections where their votes count the least. This seems to imply that people aren't making well-calculated choices to refrain from voting because they believe their vote doesn't count. The high turnout in presidential elections over local ones implies to me that voter fatigue combined with a lack of voter information and get-out-the-vote efforts play a huge roll in driving down turnout. The turnout for the November election was low, but the turnouts for all U.S. elections are low. It is this trend, not the uniqueness of the 2014 election, that is the real story. As a country and a state, if we want to increase turnout we could introduce: same-day registration, automatic registration, voting on weekends, making election-day a holiday, establishing more competitive districts, and other potential reforms. But discussing mundane reforms doesn't ignite much passion. It is much more exciting to predict electoral outcomes and complain about low turnout. Ryan Emenaker is a professor of political science at College of the Redwoods. His research focuses on U.S. politics, constitutional law and American political development. He was also recently named CR's "Best Professor" by North Coast Journal readers.